Much contemporary thinking about language is animated by the idea that the core function of language is to represent how the world is and that therefore the notion of representation should play a fundamental explanatory role in any explanation of language and language use. Leading thinkers in the field explore various ways this idea may be challenged as well as obstacles to developing various forms of anti-representationalism. Particular attention is given to deflationary accounts of truth, the role of language in expressing mental states, and the normative and the natural as they relate to issues of representation. 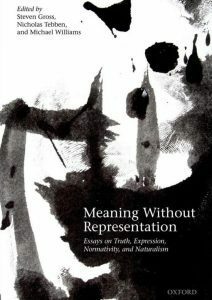 The chapters further various fundamental debates in metaphysics–for example, concerning the question of finding a place for moral properties in a naturalistic world-view–and illuminate the relation of the recent neo-pragmatist revival to the expressivist stream in analytic philosophy of language.